A family from Abiakelibi in Akwa Ibom State have now found solace in the Synagogue Church of All Nations, Lagos, after they were wrongfully accused of witchcraft and banished from the village. One of the victims, 23-year old Asuquo Etim Okon, who narrated the incident at the church premises said his two younger siblings, Etim , 12, and Lucy, 11, were sent out of the village after being accused of killing their mother. Though from Asuquo's description of his late mother's illness, it was suspected the woman died of cancer of the womb, the villagers, ignorant of the illness, concluded it was a spiritual attack from the woman's children. According to Asuquo, while the children were sent out, the family was asked to pay a fine before they could bury the late woman. Asuquo said: “Because we could not pay the fine, my mother's corpse remained in my father's house for six months. It was already decomposing. “When my mother died, I went to live with my uncle and it was from there my friend called me from the village to inform me that my younger ones were now sleeping in the forest. Sometimes, they would go and sleep very close to transformers.” Asuquo said because of their predicament, someone asked him to poison the children so as to help relieve them of the suffering and stigma they faced in the village. The young man, who said after his mother's death he borrowed N30,000 to start pay-phone business, stated that he later watched Emmanuel TV (a television channel of the Synagogue church) and decided to go to the church with his siblings. “We were in the church and Pastor T. B. Joshua was touching people. He touched my younger ones and they did not shake. This surprised me and I used the opportunity to tell the man of God what was happening to us. “The man of God looked at the children again and told me they are not witches,” he narrated. The church after the incident mobilised a team, which was said to have gone to the village to inform the people that the children were not possessed. 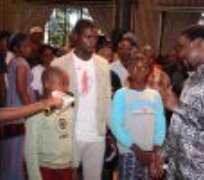 Prophet T. B. Joshua was also said to have paid the fine imposed on the family. “He bought a casket in which my mother was buried,” added Asuquo. The prophet, who made sure the village's verdict on the children was withdrawn, gave the family N480,000 and promised to rehabilitate them for sometime.